Well it's Wednesday and you know what that means!! It's Word Verification Wednesday! Eli has once again beat me in posting his critter first, Oh well the more mutants the merrier! Anyways my entry is sort of a tribute to the Planet Algol blog. I love the old school pulp stories and games that use unusual skin color humans and Algol definately has that! So I thought I'd work up a race of Zebra-Men for folks to add an unusually skinned race to their Mutant Future Campaigns. The Cherotti also have a healthy dose of inspiration from a certain Heavy Metal Magazine Cover that was a favorite of mine in my youth! The Cherotti are mutant humans with zebra-like striped skin. For this reason, they are called Zebra Men by other peoples. They find the term Zebra Men to be demeaning and prefer to be called by their proper name Cherotti. 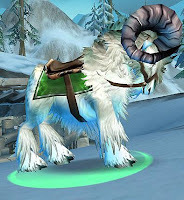 They are amazing scouts and guides, their innate sense of direction and ability to influence potentially hostile animals puts them in high demand among other races for this role. Also with their high charisma they make excellent diplomats, especially when trying to negotiate with more primitive peoples who respect their wilderness abilities. Cherotti possess an intense sense of wander lust, they seldom stay in a given area for an extended period of time. They are always wondering what's over the next hill. Slavers that have managed to capture Cherotti find they do very poorly in captivity and will eventually sicken and die if kept penned up in an area for an extended period (1d4 months). 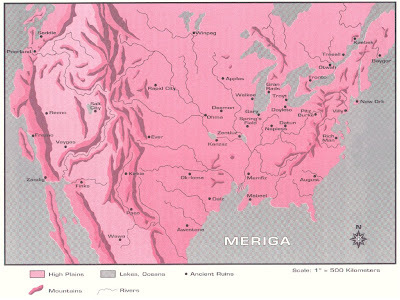 Cherotti culture has many similarities to Nomadic Native American tribes of the time before the Ancients. They travel light and move about with the seasons. Cherotti are quite proud of their stripes, to outsiders the stripes look the same, but for the Cherotti each person has their own unique and individual stripe patterns. They prefer to go lightly clothed and disdain heavy armor and gear that obstructs their stripes. It is partly for this reason that they prefer to avoid colder climates, but they can and will venture into cold areas, particularly if they think there is something interesting to see there. They have no issues with using ancient technology, as long as it is light and easy to carry. Thorites are a cryptic alliance of pure strain humans that revere the ancient Norse gods, principally Thor. Over the years they have come to be referred to as "Thorites" a label that they wear with honor. They look forward to the eventual return of Thor, the Norse god of thunder who will lead his chosen people out of the lands of Ragnarok across the Great Burning Bridge and into Valhalla. In the meantime they are to prove themselves worthy by engaging in trials of combat with their enemies. Different groups have different rituals and differing outlooks within this overall concept. They tend to wear garb and armor that would fit in perfectly in the Viking Age. 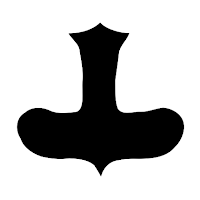 Most Thorites bear a black hammer symbol somewhere on their person, often in the form of an amulet. Many also have this tattooed somewhere on their bodies (usually their upper right shoulder). One might assume that Thorites get along well with the Knights of Genetic Purity. Being a pure strain human organization as well, however this would be an incorrect assumption, Thorites, actually tend to be distrustful of the KGP seeing them as relying too much on ancient technology and not relying enough on their own martial prowess and abilities. While Thorites will use weapons of the ancients, they prefer melee weapons, especially warhammers, mauls and sledgehammers. 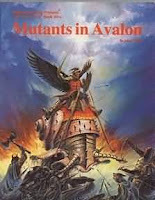 Also Thorites see the KGP as dishonorable; the KGP will kill innocent mutant women and children for genocidal purposes. Thorites do not do this, seeing it as unworthy of a true warrior. As the trolls of Asgard have their purpose, so to do the Mutants of Midgard. Thorites have no deep hatred of mutants, although they will battle any who cross them mutant or otherwise. 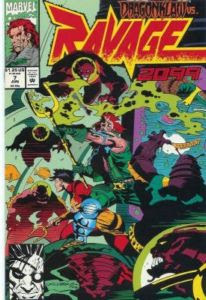 Please note this write-up is in no way meant to be a take on the real-world religion of Asatru, my write-up is based on the Thorites as depicted in the old X-Men 2099 comic book series by Marvel Comics. Weapons & Gear: Skins, Furs, Large Club (1d6) (totals 5d6+4 with club) yikes!!! Little is known about Armak's background, he is apparently a mutant Homo erectus. 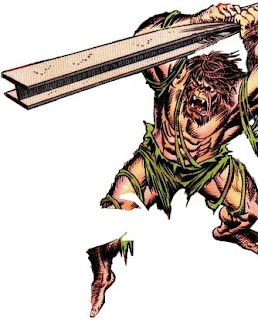 According to camp fire tales he was once a normal human named Arnald who fell victim to Brain Lashers, they used their Ancestral Form mutation to de-evolve him to a cave man state. He was brutalized and mistreated by the Brain Lashers for years, until a Homo Erectus Lord named Lok-eye led a rebellion against the Brain Lashers, Lok-eye (with help from a nearby Entiog tribe) was able to defeat and drive away the Brain Lashers, that unfortunately is when things only got worse for Arnald. Lok-eye made the Brain Lasher's Homo erectus slaves into his own minions and began to eye the lands of a nearby group of Pure Strain Humans; they were Thorites, worshippers of the ancient god Thor. Time and again the Thorites had defeated Lok-eye's dim witted Homo erectus minions. Seeking a stronger minion, Lok-eye began to experiment on his followers many died, but Arnald lived, he mutated and found himself much stronger and tougher than ever before, though his already shattered mind was even more fragmented, he somehow had come to believe that he was Armak the First Man, the original cave man if you will. 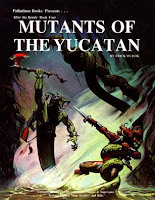 Initially he served Lok-eye but after getting a major beating by the Thorites (he fell from the top of an ancient structure of the ancients, and would have died if not for his mutant constitution), he fled into the wilderness. 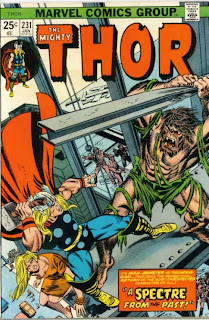 Armak is very loosely based on the Marvel Comics villain Armak from Thor #231. Look what I found! 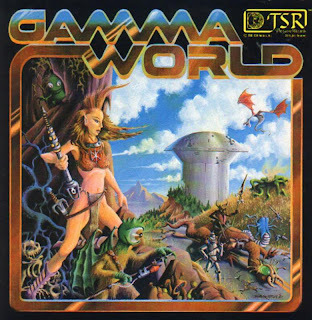 Old School Gamma World Goodness! 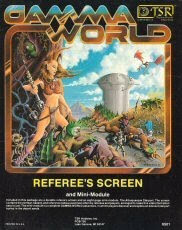 While going through a box of my old gaming stuff I found my old original edition Gamma World Referee Screen! Isn't Erol Otus just Awesome! Sadly I can't seem to find my copy of the original mini-module that came with it, it was a decent little module too. Party finds a spaceport and then things get wild. I'll keep digging through my stuff maybe it will turn up. I'm gonna have to use this screen for sure. It's just too cool to leave in a box. I can print out whatever tables I need from my Mutant Future book and then put them on my side of the screen. Good Gaming! Here is the map from the Gamma World 4th ed. rules. I thought some of you might find it interesting/useful as a resource for your Mutant Future Campaigns. 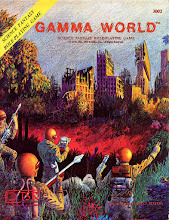 I really liked Gamma World 4th edition back in the day, but I didn't much care for some of the naming conventions used for the cities and such. The Hai Nu is a race of mutant humans adapted to an aquatic lifestyle. They are generally passive creatures, but can be dangerous if provoked. They will vigorously defend their hunting grounds and communities, fighting to the death if necessary. They have lean solidly muscled bodies that are covered in a soft fur that comes in differing shades of green, blue and yellow. They have webbed hands and feet, with short claws extending from their fingers and toes. Bony ridges encircle their sunken black eyes. They have rows of thin gill slits, extending along their necks. Hai Nu can breathe underwater without difficulty, and while they can breathe and filter air they do have difficulty engaging in strenuous activity on land for extended periods thus they limit their surface activities to short tasks. They live in warm, shallow seas of tropical and sub-tropical areas often making their lairs in the wrecked ships of the ancients. It is usually when surface dwellers are seeking to loot such vessels that confrontation occurs between them and the Hai Nu. However, the Hai Nu do love bright treasures, particularly gems and statuary and are expected to make regular tribute to a mysterious being known as the Sea Lord, if they don't have proper tribute for him, in desperation, they may raid passing ships (Simian or otherwise) in order to steal cargo to give to the Sea Lord, though they never attack to kill, if at all possible, during these raids. The relations between Hai Nu and the various Simians vary. 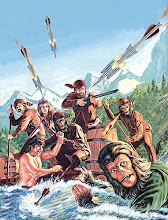 Only those apes that sail upon the seas that are home to the Hai Nu really even encounter them, and then only rarely. Unfortunately other species of fishmen that also reside in the waters of the Hai Nu are not so peaceful; the Barracuda Men in particular frequently attack the surface dwellers. To many simians all the fishmen are the same and they group the Hai Nu with these other more vicious fish folk. Adapted from MC 6 Kara-Tur Appendix by TSR. No copy-right infringement is intended. So these beleaguered simian samurai outnumbered and quite literally outgunned fight the machines amidst the ruins, in the kudzu jungles and the rubble strewn ancient roadways. Putting everything they have into holding off the machines. As long as they have life within them they have hope. For there is a prophecy…when the sacred great white ape is born and comes of age he will unite all of the simians and become a great Shogun. Saving his people from extinction…. But not all believe in the prophecy…and not all that believe it want it to come true…. It came to me in a dream….from far away…a world away…they lived…they fought…they died…they were the last, their way of life dating back to the time before time. They followed the path of honor...the code of the warrior. A code that was ancient when the ancients were young. Here they lived, in an isolated forgotten land, honing their art, their martial prowess to a razor’s edge. Few in number…once there were more, but then the machines came. These machines had been tools of the ancients, tools of war. For the ancients had forgotten the code, the true path of the warrior. Instead they forged machines to fight their wars for them. That was their downfall, for a true warrior fights his own battles, faces his own demons. And whether he wins or dies, he follows the path of honor. The ancients forgot the true path. And their machines, their tools punished them for their transgressions. Now the ancients were gone, but the code remained, the code of Bushido. And these remaining few held true to this code, though their ancestors had once been kept in cages for the amusement of the ancients, they survived when the ancients failed, they achieved new heights of awareness, of honor. They would face the enemy who had no honor with honor; they would fight to the bitter end, for they were the Simian Samurai! Well if you're still reading this, then I must have sparked your interest. This is a work in progress on a Mini-Campaign Setting specifically with the Mutant Future game rules in mind, but with minimal tweaking it could also be used for other similar Old-School style games. I recently had a very unusual dream. The dream was quite vivid and quite memorable. It basically was me observing "someplace else", the someplace being what seemed to be a forgotten land somewhere amidst the post-apocalyptic ruins of Japan. The civilization of mankind had fallen, apparently a victim of its own ignorance and violent ways, but Civilization continued on…Apes had gained sentience, how wasn't explained, but they walked more upright than their ancestors, dressed, and used tools. These different species of ape lived and worked together struggling to survive in this new Dark Age. Of particular interest was that some of these apes had adopted the ancient ways of the Samurai. 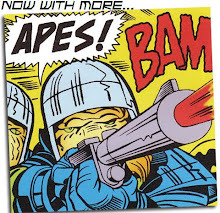 The apes however were not all in agreement, indeed different groups had different agendas, some vied for power over the rest, others sought to hold the mutant beasts at bay and protect their people, while others were somewhere in between. But these simians were not alone. 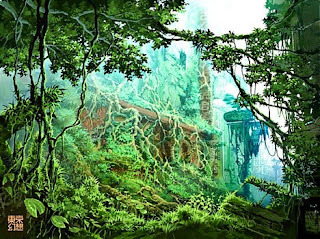 The dark legacy of the ancients still lurked, not only were foul mutant beasts and the degenerate descendants of man to be found in the ruins and wilderness outside of their communities but something far more dangerous existed. The machines still stirred…The robot armies of the ancients still existed somewhere out there…and still hungered for war. Merry Mutant Christmas! 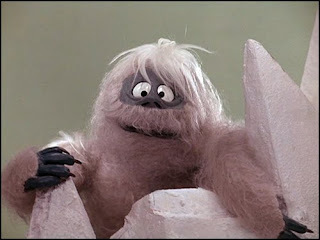 The Bumble! Inhabiting only the coldest of icy regions the Bumble are seldom encountered by civilized folk. 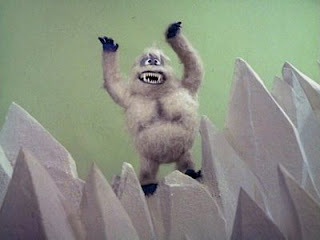 Indeed there is speculation among many as to whether the Bumble is a unique mutant beast or if there are several of the creatures living in the frigid northern wastes. There is an old legend that tells of an explorer of the ancients a Pure Strain Human who tamed a great Bumble and taught it the ways of good. From the long-running Christmas special Rudolph the Red–Nosed Reindeer produced in stop motion animation by Rankin/Bass. It first aired December 6, 1964. One of my personal childhood favorites! I just wanted to take this moment to wish everyone a very Merry Christmas! Though I've only had my blog for a short time, I can't believe all the friendships I've made in that brief period, people from all across the world coming together to laugh, share ideas and engage in fun and friendship. 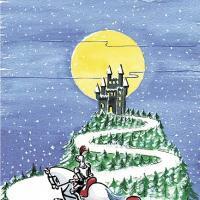 So whatever your beliefs and celebrations may be I send you warm thoughts and good will. In case you couldn't tell from my blog I love comics. I used to collect them regularly. That is until they priced them out of my ability to purchase. 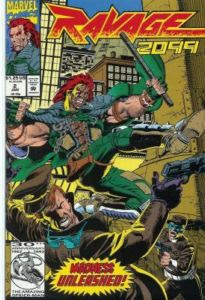 Being an old grognard I can remember when comics cost .35 cents each. So when they went to $3-4 bucks or more and you have to buy several over different lines to get the whole story, I just couldn't afford to keep up. I do on occasion pick up the trade paperbacks or compiliations. Anyways yesterday I stopped at my local FLGS (I pass it on my way home from work), and went inside to see what new stuff they had. My FLGS is also a Comic shop, actually it's really more of a Comic Shop than a game shop, but I digress..anyways I happened to notice box after box of comics for .25 Cents! So I started digging through them. 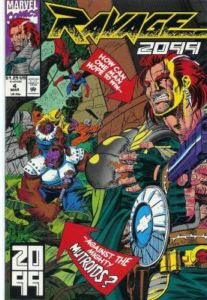 I found several issues from the Marvel 2099 series from the '90's. Picked up a whole stack of them for dirt cheap. I felt like a kid in a... well a comic shop! 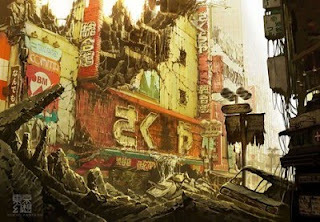 Now these stories aren't ground breaking or blow you out of the water exciting, but I've gotten several ideas for NPC's, areas and groups for my Mutant Future games. Alot of the stuff would probably fit in better with a Cyberpunk Campaign or some such, but for 25 cents I can't complain. Now I'm just gonna have to use the Sisterhood of the Howling Commandments in my game at some point, I mean Nuns with Guns! How cool is that?! In no particular order, and not showing all that I picked up by any means here's some covers of some of the comics I picked up. Well its Wednesday and you know what that means!! 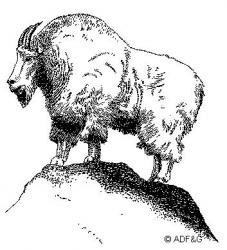 Obilli (plural is Obillis) are giant mutant mountain goats, their name is believed to be from the term Old Billy, as in an old billy goat. Obillis are prized as mounts in areas of cold climates. They can climb rocky and rough terrain without difficulty and are unbothered by even the coldest of temperatures. Of particular value to their riders is their innate Force Screen ability. If attacked the Obilli's rider will also be protected by this screen. Some claim this is because of the special bond riders share with the Obilli, while others claim it is because the Obilli are too dumb to know where they end and the rider begins. Either way they are highly valued in cold communities, especially those located in rocky and mountainous areas. Some warlike communities have tried to breed bigger and meaner Obilli to use in warfare, but this has not been overly successful. 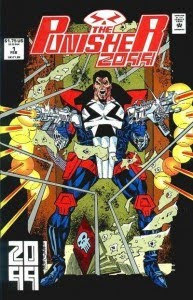 In the late 80's (86-87) I stumbled across this comic. Being a long time Gamma World fan, I of course picked it up. It was really cool, I loved the art and was quite intrigued by the direction the story seemed to be going. I made sure I got the following issues. I was disappointed when the series cancelled due to financial reasons. One curious item of note is that years later at a local Con, I learned my wife and the series artist Mitch Foust were buddies in high school. How cool is that? 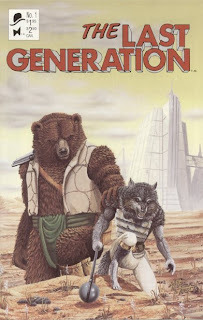 Anyways if you like Gamma World and can find this short-lived series you might want to pick it up. Shamanistic bears, Wolfmen, the Angel, and what seems to be an Egyptian god. Cool Stuff! Whew what a day....survived the Mall..shudder...still not finished shopping though...shudder..
Anyways thought I'd do a follow up to my earlier post. There are a couple of additional resources out there for those of you looking for Mutant Dinosaurs a la TMNT style. 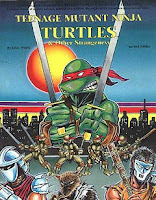 This one has an article featuring several dinosaurs worked up with the whole TMNT Bio-E format. Some duplication of dinosaurs from Transdimensional exists but these are done for After the Bomb 2nd. ed. I have seen where some folks have complained that the dinos weren't tough enough in this article, but that can always be tweaked by the GM anyways. This is the follow up to the previous Rifter dinosaur article; describing Mesozoic Land. This is a pretty cool setting, imagine Jurassic Park but the dinosaurs are done up TMNT style. I need to be out finishing my Christmas shopping, but I'm ailing with a lousy cold. So here I sit thinking of all the things I need to be doing. Christmas sorta snuck up on us this year, we've been putting in some major time at work the past month and I just realized..."Oops Christmas is upon us!". Wish I could somehow zip back and get a day or two to finish some things. 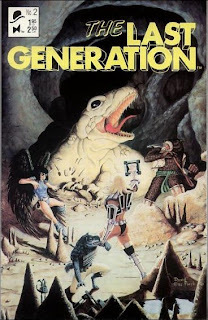 Which got me thinking, dangerous I know, of a cool game book in my RPG library. I've already mentioned After the Bomb and it's adventures elsewhere in my blog. 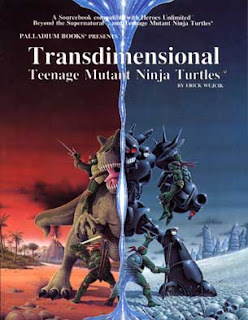 Another nice book in the TMNT RPG line-up is Transdimensional TMNT. 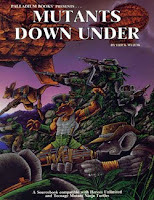 This book is also by one of my favorite game designers/writers Erick Wujcik. The book has some interesting rules for time travel and even gives a few brief write ups of some other times/settings. Might give you some ideas for that player who loves to Plane Shift on ya. Have him appear on a skull covered plain facing off against a battle mech or a T-Rex and he might not be so eager to plane hop away from your Mutant Future monsters. 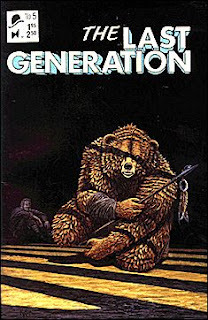 This book also contains additional mutant animal types, but these aren't just any animals. No they are prehistoric beasties! Dinosaurs, Smilodons, Mammoths and other cool beasties. 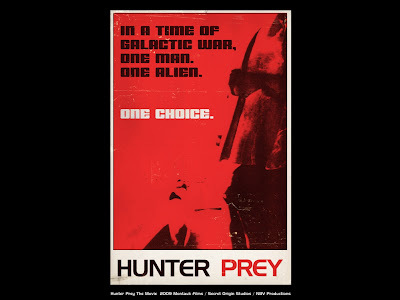 Want to work up a sentient gun-toting Raptor Commando! It's in there! I could see maybe having a secret lab of the ancients somewhere in your Mutant Future Campaign that's been experiementing with Dino DNA to create super-soldiers. Maybe the base is discovered by your players or someone else, or perhaps a earthquake has allowed the base to be uncovered and now some really interesting new prehistoric players are in town! Well in reviewing the time travel rules, I see if your not careful you could get pretty jacked up! Potentially devolving or evolving (into some kinda alien grey lookin thing), so I guess I'll put my time travel machine back up in the attic, load up on vitamin C, bundle up for the cold and go fight the holiday crowds. Stench Kine are the cattle of the wastelands. They roam the reeking polluted plains and wastes. These odorous beasts form great herds, grazing on poisonous plant life that would kill other creatures. A herd will contain 5-30 young, but the young have no attack form. For every five beasts encountered one will be a bull. The bulls are the more aggressive members of the herd and will defend the herd if necessary. When many creatures developed thick carapaces and/or powerful attack forms in order to survive, the Stench Kow took a different "evolutionary" approach. 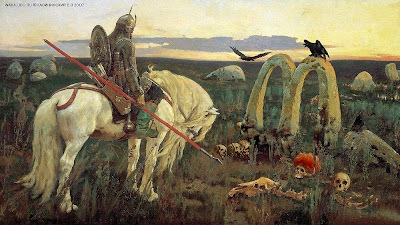 The beasts became so foul in both smell and taste that no predator in its right mind would even think of approaching a Stench Kine herd, much less eating one of them. Even the ever hungry Ostragnon leave Stench Kows alone. Stench Kine resemble huge, misshapen bison. Bulls have large humps over the shoulders, and cows have smaller ones. Horns are long and downward curving. Heads are huge with pugged features, large round eyes and lolling heads. Coloration is a dull orange with greenish, matted manes. For the most part the Stench Kow prefer to be left alone grazing on their preferred diet of fetid plant life, however , if they feel threatened they will charge the offending person, attempting to Gore/Trample the foe and then move off. This is usually enough, because by then the intruder is affected by the beasts smell. In close quarters, the odor of their breath and bodies is so foul that a save vs. poison must be made in order to avoid vomiting. Even those who successfully resist the initial effects of the smell must make additional checks for every 3 rounds in the creatures range. Those affected by nausea will be driven to leave the presence of the beast, and will be only able to perform the most basic of actions (minimal defense, walking, etc...), until beyond the smell of the beast. Based on a creature in TSR's AD&D Monster Manual II. Eli over at I See Lead People and I have been tossing back and forth Word Verification Challenges where we design creatures for words we come across on various word verification requests around the internet. This has been a lot of fun and recently, in a bit of email back and forth, he and I decided to make it a regular thing. Mutations: Gigantism (+1), Increased Smell, Natural Armor (tough hide AC 6), Increased Caloric Needs, Accumulated Resistance (Radiation), Martial Affinity. 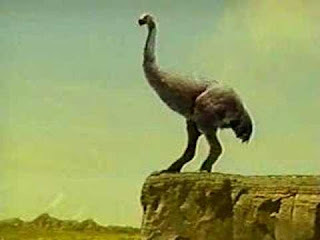 These giant mutant ostriches are fearsome ravenous beasts that roam the wastelands and badlands always searching for food. They are usually solitary, but if food is plentiful enough a small group will occasionally gather together at least until the food runs out. There are reports of humanoid villages being wiped out by the voracious appetites of larger groups of Ostragnons. Some primitive tribes have attempted to domesticate and use the beasts as large mounts, this has had mixed results, usually ending up with the Ostragnon getting hungry and eating it's would be rider(s). Well No Pathfinder Sunday today, at least not for me.. The guys got together and played, but unfortunately for me work reared its head. I'm not complaining. Alot of good folks are really struggling out there and I'm thankful to have a job. "They" claim the recession is over, so hopefully things will turn around soon for everyone. To do my part for economic recovery and to treat myself since I missed today's game. I placed a little order with Khurasan Miniatures. Some cool 15mm minis will be on their way to me very soon. I ordered some Garn, some Karkarines and some Felids. Gotta get ready for those 15mm Sci Fi Apes don't ya know! In other 15mm news I found a blog I somehow missed before : Miniature Review it has some really helpful scale pictures comparing different minis and such. Well I'm gonna go crash now. Indigors, a new beastie for your Mutant Future Campaigns! 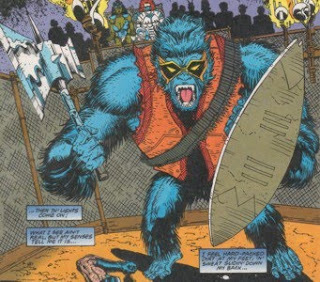 Indigors are large blue furred extremely ill-tempered mutant gorillas. They love to fight, shriek, bite and beat on each other and everyone else. Their Negative Empathy defect assures that only the toughest and meanest survive to maturity; it also causes them to tend to be loners. Mating season for Indigors is a violent and brutal affair fortunately their Regenerative ability allows the strongest to survive to mate and fight another day. 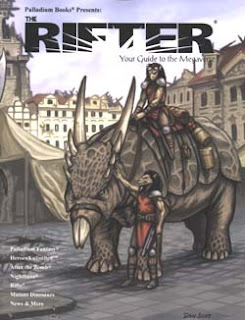 Some larger settlements have been known to use Indigors in large (large to protect the spectators from the beasts shriek attack) outdoor fighting arenas. Something the Indigors take to quite well, being used to and quite fond of fighting. Occasionally a spectator will get accidentally close enough to be affected by the Indigors' Negative Aura and will be compelled to jump in the arena and attack the Indigor, much to the excitement of the crowd and the Indigor (the more the merrier …well actually the bloodier!). It is worth noting that Indigors and Apemen have a deep instinctive dislike of each other. Not that many creatures need much prompting in disliking the Indigors, and while the Indigors have an equal loathing of most other creatures, for some reason they intensely dislike Apemen. Some Indigors have even overcome their dislike of each other in order to band together and attack Apemen villages. Being particularly vicious they wait for the bulk of the hunters to leave and attack the women and children for the sole purpose of causing the most pain and suffering. When the hunters return and pursue the Indigors they are happy to then ambush the Apemen, that is if the Indigors haven't turned on one another first. Indigors seldom if ever use technological devices. They don't have the patience or the intellect. While one could use a vibro-sword if shown how to turn it on (and who in their right mind would do such a thing), the whole concept of changing an energy cell is completely beyond an Indigor. They will use melee weapons, preferring swords, axes and other blood-letting weapons and some have learned to use shields, but they don't have the patience or ability to manufacture such items. Artwork is from Marvel Comics. I just worked up the name and creature from the artwork. The Entiog are 9' tall tough skinned cyclopeans. They tend to live in caves and tunnels in dry rocky areas avoiding outsiders. Little is known about the Entiog, one thing that is known is that they have an intense hatred of the Brain Lashers and will attack them on sight. 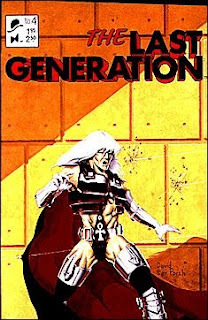 Some speculate that the Entiog were once a slave race of the Brain Lashers, and that through the development of their Mental Barrier mutation they were able to resist the Brain Lashers and escape enslavement. The Entiog avoid technology and will not take or keep it as treasure, some believe they associate technology with the Brain Lashers. They seem to keep little in the way of treasure although it is believed they trade gemstones amongst themselves. 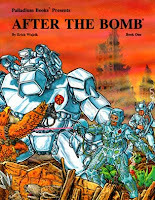 Some of you have talked about and commented about some of the other supplements for After the Bomb/TMNT. You might find some of these useful for your Mutant Future Campaigns. Keep in mind they are worked up for the Palladium System, but Mutant Future is so easy to adapt/convert stuff too you should be able to find something of use in these books. I've seen them go for pretty cheap on Ebay and I believe Palladium is now offering them in PDF format as well. 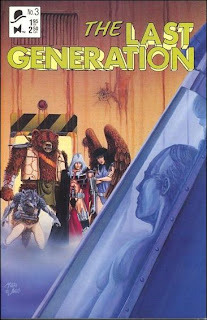 In discussing resources for a Mutant Future Campaign I'd be remiss if I didn't mention one of my favorite products After the Bomb (Second Edition) by the late Erick Wujcik. Please note!! 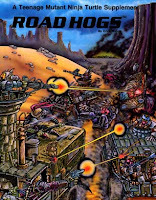 It is designed for use with the Palladium System, so it won't work as is with your Mutant Future Campaigns, but it is an awesome resource for all things related to Mutant Animals. It has all kinds of animals listed and lets you use a point buy system to work them up as characters. So if you want to add more to your Mutant Animal characters and critters, then you need to get this book!! Please note the First Edition is really just a supplement for the original TMNT rules, you'll need to have the TMNT rules to make much use of AtB first ed. 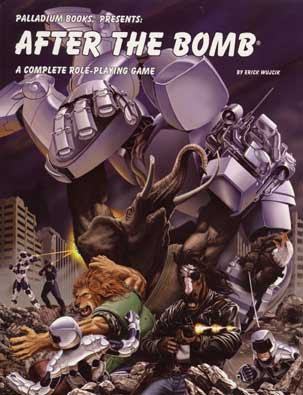 My favorite edition, and the one I'm really talking about, is the After the Bomb second edition, which was originally supposed to be a new edition of the TMNT RPG, but the whole license thing didn't work out, so they just took the Turtle stuff out of it and added in Post Apocalyptic Coolness. I've got to admit I'm a big fan of this book, I lugged mine all the way to Gen Con one year and got Erick to autograph my copy. Given his unexpected passing, it is even more treasured to me. Found by a kindly relic seeker as an infant babe, the relic seeker, who only went by the name of Johnson raised the mutant gorilla and named him O'Neil. Johnson, was a kind man, and treated O'Neil very well. 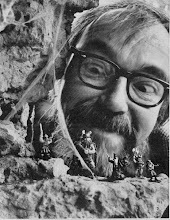 He also taught O'Neil how to survive in the wastelands. He taught him how to cook and clean, and most importantly how to be a crack-shot with a revolver. Johnson and O'Neil had a good life, tough but good, that is until one day when O'Neil was out hunting, Johnson was murdered for what he knew about "the great mother lode," O'Neil set out on a path of vengeance. O'Neil strapped on a bandolier, two six-shooters and tracked the murderers across a hundred miles of mountains and badlands. He picked them off one by one, meanwhile discovering he has a talent for banditry. He is given the nickname Six-Gun Gorilla. He was last seen just north of Madge Canyon apparently "working" the trade traffic in and around BarterStation, Guntown and Rockwood. 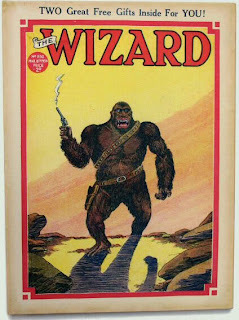 Based on the character Six-Gun Gorilla featured in the 1939 pulp, The Wizard. 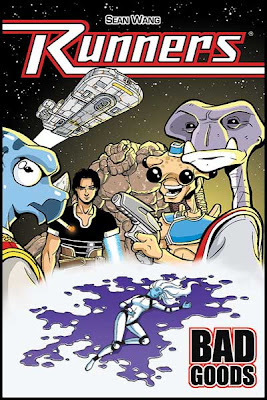 I'd like to direct you to an on-line sci fi comic Runners. It's by Sean Wang, and I personally think it is quite good. Go back to the first issue and read from there, it will make alot more sense. I think the setting is perfect for a cool sci fi rpg. 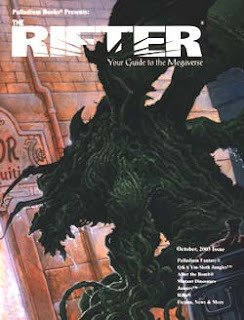 Interesting characters, cool backstory, I'd love to run a sci fi campaign set in the Runners universe. I could see the Savage Worlds rules being perfect for this type of campaign. I came across this while surfing the 'net today. Check it out. It looks pretty cool. Here's a link to the official page. Be sure and check out the trailer! *Update 1/24/10 I've recently picked up the X-plorers RPG, I think Hunter Prey will be a great inspiration for X-plorers games! Weapons & Equipment : ballistic nylon fatigues (AC5), combat boots, Laser Pistol Mk 1 (+4 to hit), Gauss Pistol (+3 to hit), Shuriken (x5), she will have other basic gear as needed. 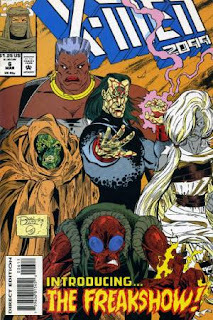 Mint Julep is a mutant human female, enslaved as a child she grew up to rise up against her enslavers and lead a group of female warriors known as the Freewomen. Over time something changed within her (perhaps losing so many of her companions) and she left the Freewomen and began the life of a bounty hunter. She is a skilled warrior, self-trained in both armed and unarmed combat. She is a skilled markswoman and and is quite adept with the use of a laser pistol (+1 bonus to hit and damage). She often uses shuriken in combat as well. 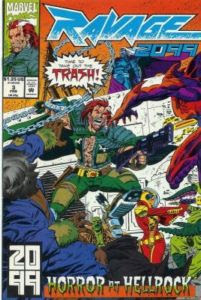 Mint Julep is from the Killraven comic series copyrighted by Marvel Comics.